SkinGenX was founded by Aybegum Senkesen, a biochemist and healthcare consultant along with her team of skin care experts in Florida to provide powerful anti-aging and wrinkle reduction skin care products with advanced formulas and high quality ingredients that are clinically proven to be safe and effective. SkinGenX only use ingredients whose safety and efficacy are proven through extensive research and analysis. While some of our ingredients are all natural and plant based, we understand "all natural" does not necessarily mean safe and efficacious. Their products never contain Parabens, PEG, PABAs, oxybenzone, Synthetic Fragrances and are never tested on animals. SkinGenX targets "Active Emotion Lines" which I feel is my hardest spot to get rid of. The lines around my eyes when I smile, and around my lips are the ones I struggle with most. The SkinGenX Anti Wrinkle Complex ($65) is a Comprehensive Anti-Aging Product Available with Neuropeptides, Anti-oxidants, Collagen Boosters and Nourishing Moisturizers all in ONE! 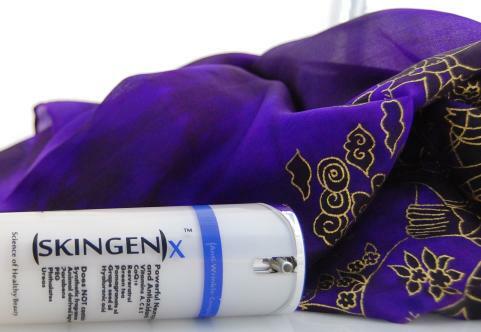 SkinGenX Anti Wrinkle not only targets wrinkles, it makes your skin softer and more radiant. It has proprietary formulation with neuropeptides, anti-oxidants, collagen boosters and nourishing plant extracts. I have noticed a visible difference in my face since using this product. It is not greasy or oily, and the results speak for themselves. SkinGenX also offers a 30 day money back guarantee if you are not satisified with the product. I love this cream, and will continue to use it once my bottle is gone. They even offer a refill program, because of such high demand. You can purchase the SkinGenX Anti Wrinkle Complex online at SkinGenX or by calling 1-800-610-GENX. To enter, visit SkinGenX and tell me one thing you learned, NOT mentioned in the above review. This is mandatory if you want to win this fabulous prize package!! - You can blog about this giveaway for 5 extra entries, just make sure you leave a link to the sponsor and me. Must be at least 50 words! - NEW! for 5 extra entries fan me on facebook!! Good luck my beauties! ♥ Giveaway ends 08-20-2010. Winner will have 48 hours to respond to the winning email or another winner will be chosen. No Po Boxes please!! I received product only for the purpose of reviewing! Thanks to SkinGenx for sponsoring the giveaway. "SkinGenX has joined PETA's Cruelty-Free Program and none of our products contain animal derived ingredients. Our products are never tested on animals." This is great. SkinGenX contain safe cosmetics ingredients tested.i always try to search for safe cosmetic ingredient products for my little girl. Like them on FB and told them that you sent me! SkinGenX is a proud signer of Compact for Safe Cosmetics and has pledged to never use unsafe or potentially toxic ingredients in its products. SkinGenX is a very eco company-they joined Peta Anti Animal Cruelty and Compact for Safe Cosmetics. Right On!! At SkinGenX, we also believe in giving back to our community. While we encourage our employees to work with the charities of their choice, we also donate a portion of our proceedings to a number of non-profit organizations. I always choose companies like these that don't test their products on animals. Great contest! I learned that the FDA does not regulate use of the terms "all natural" and "hypoallergenic" so SkinGenX do not use them. I learned that SkinGenX is a proud signer of Compact for Safe Cosmetics and has pledged to never use unsafe or potentially toxic ingredients in its products. SkinGenX has joined PETA's Cruelty-Free Program and none of our products contain animal derived ingredients. Our products are never tested on animals. They encourage their employees to give back to charities. I like SkinGenX.com and told them you sent me! I've learned SkinGenX is a proud signer of Compact for Safe Cosmetics and has pledged to never use unsafe or potentially toxic ingredients in its products. I learned they are offering a free gift with purchase-a 100% silk scarf so you can feel what your skin will feel like after using this product. SkinGexX dose not test their products on animals. I "like" SkinGenX on FB and wrote that Bella's Beauty Spot sent me. I learned they do not practice animal testing, which is very important to me. I learned SkinGenX has joined PETA's Cruelty-Free Program and none of their products contain animal derived ingredients. Skin genx does not believe in marketing hypes like, "all natural", or "hypoallergenic." Usage of these terms are not regulated by the FDA. The company donates a portion of their proceedings to a number of non-profit organizations. Now that is sweet! I love that they do not test on animals and it has retinol and COQ10 in with the other ingrediants listed which is very good for your skin. Follow you on Blog Lovin. Went to SkinGenX facebook and left comment that you sent me there. None of their products contain animal derived ingredients. I learned it contains Vitamins A, C, & E, Resveratrol, Collagen boosters, CoQ10, hyaluronic acid and nourishing plant extracts. I learned that they donated a portion of their proceedings to a number of non-profit organizations. I learned that SkinGenX has pledged to never use unsafe or potentially toxic ingredients in its products. They are donating profits from their new natural soap line to help with the gulf spill cleanup. They also help women through work cooperatives. I learned that starting in September 2010 they will start selling 100% pure and handmade plant soaps! i learned that skingenx pledged to never use unsafe or potentially toxic ingredients in its products. SkinGenX started an Empowerment Project with rural artisans in Turkey who hand paint beautiful, 100% natural silk scarves for SkinGenX. I love companies that give back.